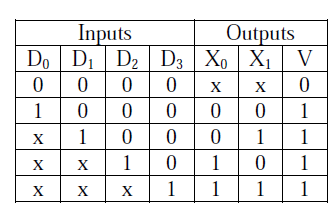 What is the Boolean expression for the output f of the combinational logic circuit of NOR gates given below? Answer is Option A. The above question contains the NOR gates. Let's see what NOR gate does. 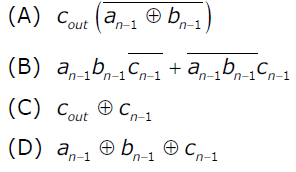 If A and B are the two inputs to the NOR gate, the NOR gate gives (A+B)' as the output. Let's assign numbers to the Gates for the easy understanding. number them as 1 to 4 ( top to down). number them as 5 and 6 ( top to down). So total signals in=a, b, c, x, y, z i.e. 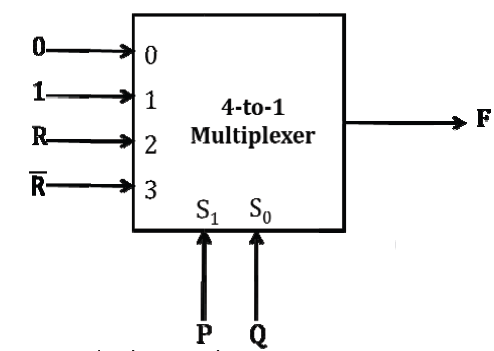 6 And total output =8*8=64 hence required decoders (from fig.) = 9 so ans is ( C) part. 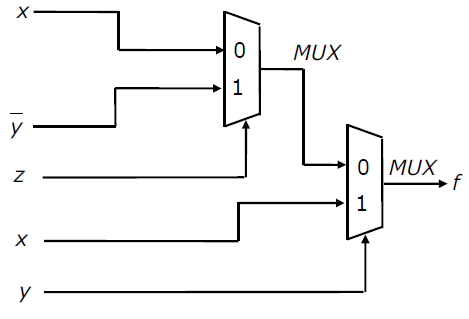 Suppose only one multiplexer and one inverter are allowed to be used to implement any Boolean function of n variables. 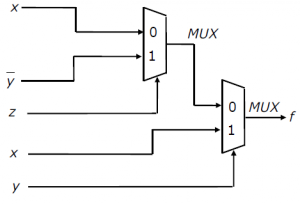 What is the minimum size of the multiplexer needed? So, total AND gates = 1+2+3+4 = 10 , OR gates = 1+1+1+1 = 4 So as a general formula we can observe that we need a total of " n(n+1)/2 " AND gates and "n" OR gates for a n-bit carry look ahead circuit used for addition of two binary numbers. Consider the following combinational function block involving four Boolean variables x, y, a, b where x, a, b are inputs and y is the output. 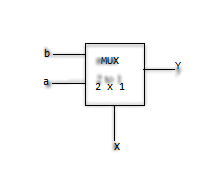 This function can be interpreted as having two inputs a, b and select signal x. Output y will depend on the select signal x. Function will be like (ax+bx’) Its implementation will be like So ans is ( C) part. Consider the circuit above. Which one of the following options correctly represents f (x, y, z)? Output from MUX 1=> Z’X+ZY’ Output from MUX2=> Y’(Z’X+ZY’)+YX =>Y’Z+Y’Z’X+YX =>Y’Z+X(Y’Z’+Y) =>Y’Z+X(Y+Z’) USING A+A’B=(A+B) =>Y’Z+XY+XZ’ So Ans is (A). For carry look ahead adder we know carry generate function--- Where As we are having two 3 bits number to add so final carry out will be C3- Putting value of Pi,Gi in 3 C3=(A2.B2)+(A1.B1)(A2+B2)+(A0.B0)(A1+B1)(A2+B2) (TAKING C0=0) C3=A2.B2 +A1A2B1+A1B2B1+(A0B0)(A1A2+A1B2+B1A2+B1B2) C3=A2B2+A1A2B1+A1B2B1+A0A1A2B0+A0A1B0B2+A0A2B1B0+A0B0B1B2 SO ANS IS (A) PART. We consider the addition of two 2’s complement numbers bn-1bn-2...b0 and an-1an-2...a0. 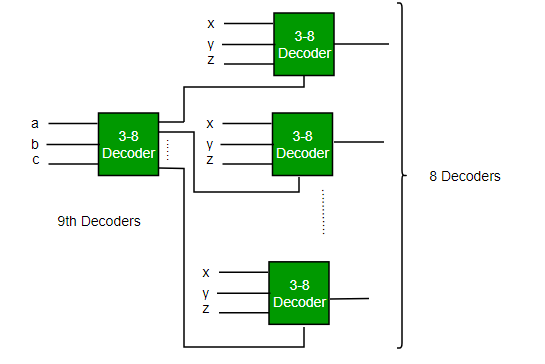 A binary adder for adding unsigned binary numbers is used to add the two numbers. The sum is denoted by cn-1cn-2...c0 and the carry-out by cout. Which one of the following options correctly identifies the overflow condition? Overflow occurs only when two same sign binary numbers added and result of these numbers is different sign in 2's complement representation. Otherwise overflow can not be occurred. Counter example for given options (A) 0111+0111=1110 has overflow, but given condition violates. (C) 1001+0001=1010 has no overflow, but given condition violates. (D) 1111+1111=1110 has no overflow, but given condition violates. Only option (B) is correct.